Sisters, Brothers, following in the footsteps of our elders in the paths that were born in the Catedra Tata Juan Chavez Alonso, we gathered together on 30th January 2016 in the Chinanteca community of San Antonio de Las Palmas, municipality of Tuxtepec, Oaxaca, we, delegates of the Mazateco, Binniza, Chinanteco, Maya, Purepecha, Otomi, Nahua, Wixarika, Tepehuano, Tzotzil, Chol, Popoluca, Zoque and Tzeltal, coming from 32 communities of the states of Chiapas, Oaxaca, Veracruz, Yucatan, Campeche, Guerrero, Michoacan, Estado de Mexico, Morelos, Distrito Federal and Jalisco. We gathered to see and to listen to the other, to those who every day experience dispossession, repression, disdain and exploitation in each one of the corners of the indigenous geography, where lightning announces the storm that is covering our territories, a storm conceived in the darkness of capitalism. We meet to know each other again in the history of our ancestors and our own history, to look and find the paths and to be able to continue to exist as we are in each community, neighbourhood, nation and tribe which eac day weave together this Indigenous National Congress (Congreso Nacional Indigena) in the difficult task that we the indigenous communities inherited of taking care of the world. From here we turn our collective eyes to try to understand the horizons where we see what we see. We see the paths built by lies that are being offered to us, with the multiple faces of those from above who claim to be sensitive to the pain and desperation of those of us from below who suffer this war. The paths being offered by the people in the middle who claim to be on our side but at the same time flirt, embrace, dialogue and negotiate our pain and hope with those from above, offering our compañeros status, television cameras, travel allowances, resources and projects that disfigure our struggle and make the fabrics which are being built from below fade away. We also see the one who being at the bottom dreams of being on top and who becomes the executioner with a dead heart who we don’t see until he murders us, divides us, gives our mother earth to those that want to destroy it, even though he knows that is his mother too. He manages to trick our people to accept the lies and betrayals from the government, telling us that the intentions of the government are good. But we also see the path that we share here below, one that arises from the collective heart of a people, one that listens to itself and understands the feelings of the brother or sister who is in struggle and who suffers just as much as we do, from the one who understands that justice is cultivated in the land, as it was cultivated by our compañero Federico Ortiz, brother of the Purépecha people, whose legacy invites us always to walk alone, without political parties, without anyone tell us how or where. These are the steps and the horizons that we see when we look into the long path that remains unbuilt by the organised peoples of the Indigenous National Congress. 1.- We endorse the rejection of the territorial dispossession in Chinanteco indigenous territory, through the imposition of ecological reserves, payment for environmental services, programmes which lead to the privatisation of the land like PROCEDE Y PROCECOM, and the rejection of the13 tourist corridors, as well as the Tuxtepec-Oaxaca highway that is expected to dispossess 11 Chinanteco and Zapotec communities, all these together with mining concessions in communal territories. We denounce the lack of justice in the crime against Maximino Salinas Hernandez, community authority of San Antonio de Las Palmas, who was ambushed and murdered on the 30th of June 2013 by paramilitaries who operate in the area protected by the bad government, and [we denounce] that today the murderers are still free. 2.- We denounce the complicity of the three levels of the bad government in trying to dispossess and privatise the totality of the communal lands of the Tepehuano and Wixarika people, from the autonomous community of San Lorenzo de Azqueltan, Jalisco, and we ratify our recognition of their territory and autonomous authorities. 3.- We repeat our rejection of the destruction of the holy places that sustain the autonomous social fabric of the Wixarika people, a destruction carried out through aggressive mining projects in the Wirikuta desert, San Luis Potosi, where despite the existing judicial suspension of 78 mining concessions, illegal exploitation still persists in the communities of San Antonio de Coronados and La Presa Santa Gertrudis, with the open complicity of the bad governments, who maintain a continuous campaign of division to consolidate this cultural and environmental destruction. 4.- We denounce the existing onslaught by the government and entrepreneurs to take possession of the shared land, archaeological sites and sacred places of the Maya people in the state of Yucatan, in particular the dignified fight of the people in the community of Chablekal in Merida municipality to try to stop the sales of the land for the benefit of rich people and real estate companies at the expense of the deprivation of the right of the majority to land tenure. In the same way we demand an immediate end to harassment and repression against the members of the network against high electricity tariffs from Candelaria, Campeche. 5.- We repudiate the militarization of indigenous territory in the region of the Chimalapas, on the border between the states of Chiapas, Oaxaca and Veracruz, and the intention to build a Base of Mixed Operations, on the pretext of halting the land invasions, when we know perfectly that the state and federal governments are the ones who, with their lies, their perverse projects and dispossessions in other territories have been and are responsible for the growth in invasions and for causing conflicts between people inside the same community. 6.- We demand the cancellation of the death projects that have flooded several communities in the state of Mexico, ignoring the will of the Nahua and Ñatho communities, amid supposed consultations which have done nothing but dismiss the words of the indigenous communities. An example of this is the case of the Toluca-Naucalpan highway; the imposition of this highway violated systematically and aggressively the autonomy of the communitarian assemblies, as did the strong police presence [designed] to intimidate the voices that were against the destruction of the Otomi Mexica forest in the communities of San Francisco Xochicuautla and San Lorenzo Huitzizilapan, the police presence was also used for the safeguarding of the machinery of the private company Autovan, winner of the concession for this work. We likewise demand the cancellation of the construction of the new airport of Mexico City and the complementary works that are already leading to the destruction and plundering of communities in the basin of the Valley of Mexico and the life of Texcoco Lake; this project has already had serious violent consequences, such as those suffered by the people of San Salvador Atenco in May 2006 which still haven’t been resolved. Those of us who make up the Indigenous National Congress reiterate that we will not forgive or forget the murderers, torturers and rapists, neither those who performed the actions nor those who commanded them. 7.- We salute the decision of the ejido Tila in the state of Chiapas to take steps towards autonomy and their decision to remove the Municipal council, as well as the communitiy of Los Laureles and San Hisidro who recovered around 70 hectares in 3 ranches which they had previously lost by dispossession. 8.- We denounce the absolute impunity that has existed as regards the murderers of the child Hidelberto Reyes from the community of Santa Maria Ostula, Michoacan, who was murdered by the Mexican army on 19th July 2015 in the operation to arrest the commander of the community police, Cemei Verdia Zepeda, who was released on 24th December of the same year. And the impunity and protection enjoyed by Mario Alvarez Lopez and Federico Gonzales Medina, chiefs of the Knights Templar (Caballeros Templarios) cartel on the coast of the same State (Michoacan,) who were the intellectual authors of the 34 murders and 6 disappearances suffered by the communal farmers of Ostula since 29th June 2009, which had as an objective the dispossession of the land and beaches for drug trafficking, by taking precious wood from trees in danger of extinction, and the legal and illegal exploitation of minerals in the whole region. All this through joint operations between all levels of the bad government and gangs of narco-paramilitaries. We demand absolute respect for the autonomy of the community, their community police and their territory. 9.- We reaffirm the inalienable demand that the Mexican government present alive the 43 compañeros, students of the Raul Isidro Burgos Rural Normal School of Ayotzinapa, Guerrero, and we demand punishment for the police, military and political commanders responsible for this crime. We know that from the State all we will have are lies and betrayals to try to hide their guilt and obstruct the research that has been done by the Interdisciplinary Group of Independent Experts from the Inter-American Commission of Human Rights. 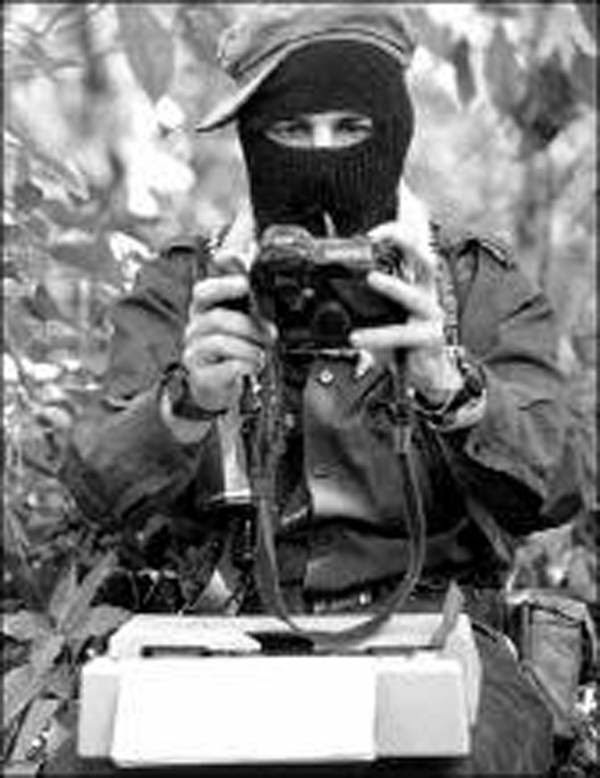 10.- We repudiate the rearticulation of paramilitary groups in areas surrounding the EZLN support base communities, accompanied by the increase in military patrols by land and air. We want to point out that the war against the Zapatista communities is also a war against all of us who dream, build and struggle for another possible world, and that as the Indigenous National Congress we will always be alert and ready to act as necessary. 11.- We stand for the immediate release of the political prisoners of our peoples, whose only crime has been the defence of our mother earth, of dignity and life for their peoples and for future generations. – Zacarías Pascual García López. We will continue walking below and to the left, because it is only there where truth and justice can be reborn for our peoples, only there where we can build with our hearts set on future generations and our roots planted in those who have preceded us, where life can begin for all without exception.